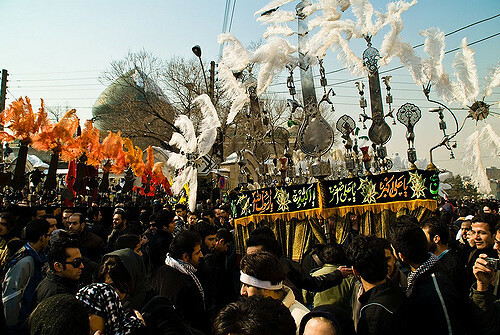 As to the innovation on tenth of Muharram, some people remain thirsty in order to express their sorrow, hold gatherings and commit acts which are patently innovations. Allah or His Messenger has not asked or allowed them to do so. Such acts were not performed by the early Muslims or by the Prophet’s family members. It was on this day that Allah granted martyrdom to Hussain (May Allah be pleased with him), the Prophet’s grandson, and the leader of the youth in Paradise and his family members. Allah humiliated the transgressors who inflicted this act of injustice. Of course it is a tragic event in the Muslim history. It was rather a calamity. However, it should be treated like any other tragedy. The practitioner of innovations, have, however, invented practices of all sorts. What is worse is that they have added reports slandering the Companions who had nothing to do with this incident. “We are from Allah and to Him we should return”. If one recites the same as many times as he is reminded for a suffering, Allah would reward him each time as much as he , did at the time when the calamity struck him” (Imam Ahmad and Ibn Majah). Hussain is the narrator of this report and it is communicated by Fatima who herself was present at Karbala. To commemorate a certain day or days of mourning is not sanctioned by Islam; such practices were more common in the days of Jahiliyah. By inventing such a practice these people have deprived themselves of fasting on this particular day, though fasting on this day is in line with Shariah. On the one hand, the above practices have been invented by some and on the other, their opponents have introduced some further new practices. For example, they take bath, shake hands and spend more money on their household on this particular day. And they cite certain Ahadith in order to indicate their stance. However, such Ahadith are false and fabricated ones. The differences among Nawasib and Rawafid are well-known. When Nawasib observed that the Rawafid mourn on tenth Muharram, they declared it as a day of celebration out of their spite for Rawafid. Both the groups are equally misguided and false in the innovations. Both of them are in error. Relatively speaking, Shi’ites are more guilty of lies. It does not, however, allow anyone to change Shariah out of one’s enmity against evil. The practices of both Nawasib and Rawafid are equally undesirable. Satan intends that we be distracted from the right way. Once he succeeds in his plan, it is immaterial for him which group is joined by the people as both ones are misguided.